Who knew there was such GREAT BACKCOUNTRY sledding in our own little corner of the world? Well, let our Sled Den Guest House be your home away from home in Gaspésie while you explore the playground we've discovered. The drive is definitely worth it. 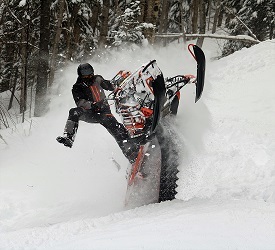 Jack raved about his first backcountry snowmobile adventure to La Gaspésie. During my own visit, I just had to agree – so much so that we decided to make it our base for Quebec snowmobiling. We had snowmobiled most of the trails in and around Montreal…all those within a day’s drive and with many overnight and weekend trips. Our sleds made tracks touring the Mont Valin backcountry – Valinouet – more than a few times – just beautiful…..! Are you a trail rider? 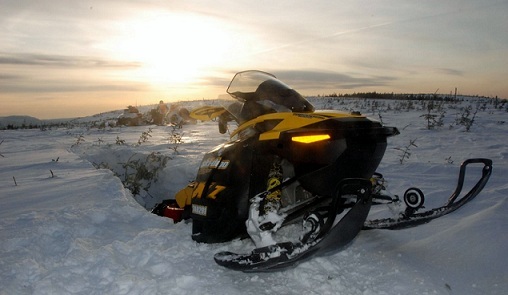 Travel along the main Trans-Québec Snowmobile Trail # 5 - try some of our Regional trails – loop around the Local ones. Whether you plan to spend only a few hours on the trail or if a full day’s sledding is your goal – it’s all good. Access to fuel, food and lodging is fairly convenient. What if back country riding is your thing? Or side hilling… or hill climbing….? Maybe you’ve always wanted to try but never had the opportunity. Well then, come play in a sledder’s paradise…..
From the fairly easy boondocking (who thought up that word anyway?) to the technical tree riding – pick your spot. You just have to discover where the best ones are! But don’t worry, there are plenty to go around………. ...just don't spend too much time trying to decide which one is next !! You can take it easy or take on a challenge or something in between, whatever your preference, the Chic chocs are waiting for you…..
Come practice boondocking on powder covered meadows, fields and logging roads. Or, if you’re just learning to boondock, as Jack says, it doesn’t hurt to fall in the snow…….he should know, he’s done it often enough……..he’s still in one piece and he’s really good at it now..….the boondocking I mean! There’s plenty of sidehilling available – just how adventurous are you? Tree riding ? Let’s see just how good you are………and don’t forget your shovel. It’s not so easy to dig out your sled with your hands – I know, we’ve done that often enough too! How about high marking? How confident are you……in your machine? OK – it’s not the Big Iron Shootout in Revelstroke but still, you will be tested……. If you’re looking for more than sledding on the groomed trails but don’t quite want the extreme of tree riding, then off trail snowmobiling is for you. 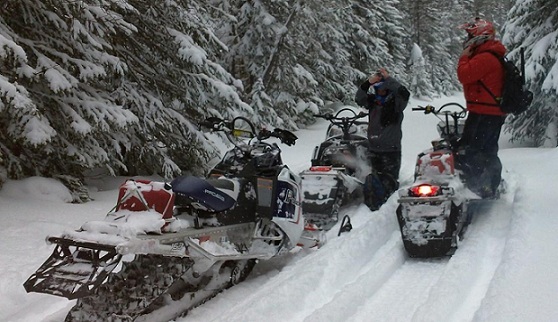 Let curiosity lead you down miles and miles of logging roads and nooks …..
Let’s go on a snowmobile adventure……….. The Gaspésie Sled Den Blog keeps you up to date with all additions and changes to the Gaspe-Snowmobile-Adventures.com Web site. Subscribe here. These are Blogs from past months and past Seasons - just for reference!